I know this flies in the face of the reputation of the French woman who cares about her appearance and must stay thin at all costs. But the truth is, since Parisian women generally walk a ton, don't snack, and don't have a weight issue, they don't talk about their "regimes" (their "diets") either. I have yet to eat a meal or go to a party with a French woman who refuses to eat something on the grounds of it breaking her regime. I have, literally, never heard a French woman mention a food's calories or fat content. One of the only times I've heard anything like this mentioned is when my friend Beatrice sees me eating a pastry after school with my girls. She says, "Ooh, if I ate pastries with the kids, I'd get fat!" I explain that for all of us, it isn't a daily treat, but rather a weekly one. And besides, the irony to me is that she says this with five -- five! -- baguettes under her arm for her family dinner. I tell her that, as Americans, we really don't eat bread with every meal and sometimes not even for days on end, so instead I have the occasional pain au chocolat. This explanation satisfies her, entirely. And yes, I have seen her eating desserts and pastries. It always made me sad when the girls, with their perfectly healthy little bodies, talked about their weight, their stomachs (those cute little bellies), and their thighs (really?!). Gigi tells me that here in Paris, she literally never hears girls talking -- in middle school -- about their body shapes, their weight, or their food choices in relation to weight, except of course for the inevitable (and age-appropriate) mentions about which 7th graders are starting to wears bras. For anybody with girls this age in the US, you know they already have body image issues all around them (if they don't have the issues themselves). It's so refreshing to be in Paris for that reason alone, although I am aware that one of the tools in many a Frenchwoman's arsenal so they don't have to think about weight is cigarette smoking, and I don't want my kids going down that road, either. When I do hear of a French adult (man or woman) who feels the need to eat healthier, the only regime they seem to go on is to....eat healthier and exercise more. One of my friends decides he wants to cut out charcuteries and cheeses at night, right before bed (the French generally eat late), and replace them with more vegetables. Which isn't to say that he would refuse charcuterie or cheese for a special occasion. It's all about moderation. I don't hear about fad diets, yo-yo diets, or fully-committed-lifestyle-changing diets -- liquid, grapefruit, Atkins, paleo, whatever. Even in the health food stores, the major selling factor for most products is not about weight loss. It's not just people's attitudes about regimes that are different here, it's the regimes themselves that are mellower and more about common sense that fast-acting gimmicks. We're in the season when people are eating loads of rich food, and in the US, that means that millions of ads and images for the New Year's Resolution Diet are just minutes away. With much less fanfare and folderol, the French will simply go back to their normal eating habits, and their normal weights. The French may be the ones who have the reputation for caring so much about their body shape, but it's the American obsessing about going on diets. 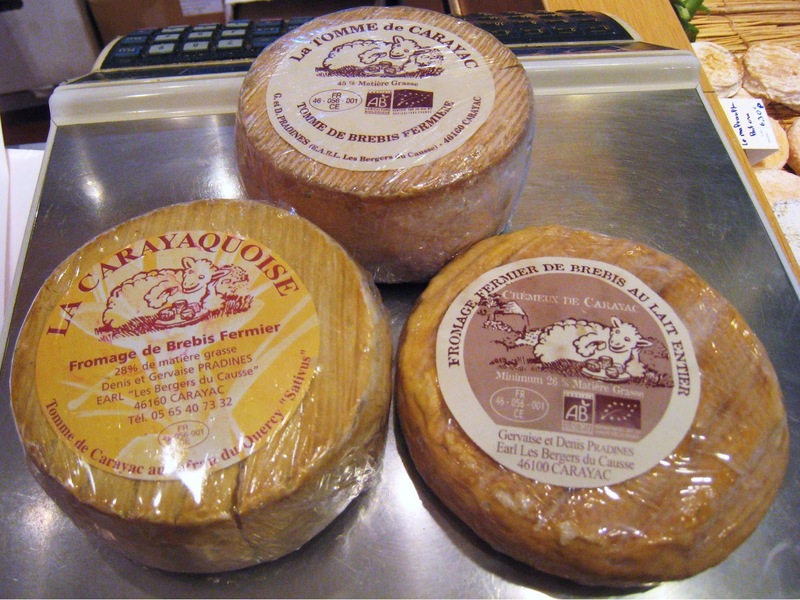 Crémeux de Carayac is one of several raw sheep milk cheeses made by the Pradines family at their farm "Les Bergers du Causse" in Carayac, in southern France, in the department of Lot in the Midi-Pyrénées region. Being near the Pyrénées, it's no wonder that it's so sheepy. What you might not expect is the one on the left which is infused with saffron, but that's a different cheese, and a different story. This cheese is, as the name suggests, is one of their softer creamier versions. Yet still, it seems more of a hard cheese. It's somewhere between the two, really. It's an orange cheese in every sense -- not just the color, but also the unmistakable aroma of sweaty feet having just gone for a 10k run. Since smell is so closely linked with taste, it also tastes like somebody's just gone for a 10k run. This little guy packs a tang and a punch that is not for the faint of heart or the cheese-fearful. Despite Crémeux de Carayac being a cheese, and an officially "creamy" one at that, going by the name, the French would not run away from it as a food that "breaks their diet." It's just a cheese. If you're French, you have a little, you have a lot, you walk it off, you run it off (in which case, your feet smell like the cheese). Whatever it is you do, most likely you don't think about it in relation to your weight; you just eat normally, and moderately, and move on.